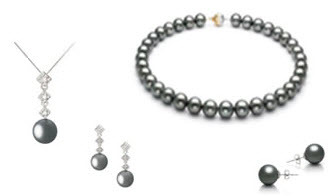 Value of a specific Tahitian pearl as well as the finished jewellery piece is dependent on many factors. The most important are size, shape, luster and surface quality. These factors you can immediately see. Also, a less visible value factor is nacre thickness. Regulations require that Tahitian cultured pearls have a minimum average of 0.8mm nacre thickness. The next value factor is how well matched the pearls are within necklaces, earrings and other finished pieces. Another factor in evaluating Tahitian cultured pearls is the luster. Luster or shine is how well a pearl reflects the light that falls upon it. A pearl with outstanding luster will have a mirrorr-like shine and very sharp image reflection. The metallic shine makes the luster of cultured Tahitian pearls unique. Another pearl value factor is the cleanliness of the body or surface of the pearl. The less visible spotting, the more valuable the pearl. Pearls are a naturally formed organic gem so some minor surfaces blemishes are perfectly acceptable. Set jewellery should take into account the position of blemishes. The size of the pearl also does effect the value. A larger pearl with similar other value factors will be more valuable than a smaller one. However, there is a size range where values increase exponentially. Tahitian pearls average between 10mm to 11mm. As a result, pearls at or under that size range are more readily available. When the size range increases to 11mm to 12mm and subsequent 12mm to 13mm and greater than 13mm ranges, the value increases dramatically. The largest on record as of 1998 is 26.95mm. Cultured Tahitians are nucleated with round beads. However, only about 40% are round and an additional 20% are symmetrical. As a result, the rounder the pearl, the more valuable it is. Existing rules maintain that Tahitian cultured pearl nacre must at minimum an average of 0.8mm over the entire pearl. This means that the vast majority of the cultured pearls will have good nacre covering. As each individual Tahitian pearl can take five to six years to grow from oyster spat to pearl harvest, matching is a very important factor. To find just two to match for earrings requires sorting through thousands of pearls. As a result, a well matched necklace or jewellery set is highly valued. The pearls should not be exactly the same but with only a slight variance and pleasing in colour. There should be no obvious differences or anomalies.